Disclosure: I received a complimentary copy of this DVD for review. All opinions are 100% my own. Ok let's start with I LOVE THIS MOVIE!!! I originally saw it in the theater with Adrian and was amazed. So when I was offered to review it for the blog, I jumped at the chance to share this amazing movie with all of you! Now tell me they don't look real. I felt like I was there actually walking with the dinosaurs on their journeys! I do recommend this movie for older kids (7+) since you need to pay attention to the dialogue between the characters to really understand the movie. 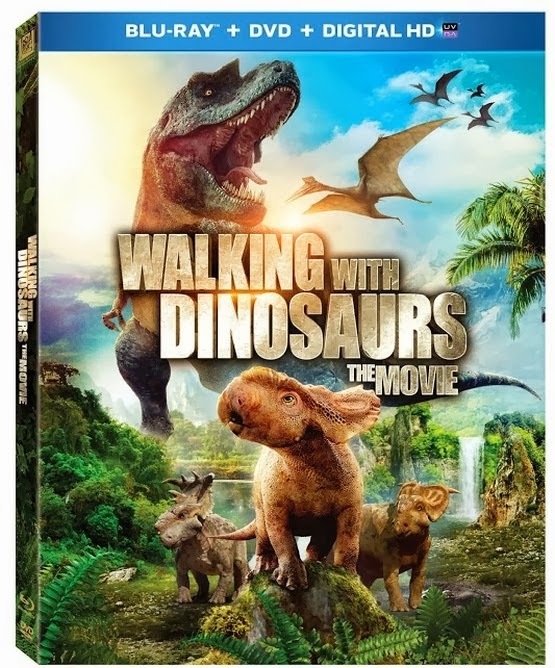 I know you will definitely become a dinosaur fan after watching it! In a time when dinosaurs rule the Earth, the smallest of the pack - a playful Pachyrhinosaurus named Patchi - embarks on the biggest adventure of his life. As he tries to find his place in a spectacular world filled with fun-loving friends and a few dangerous foes, Patchi will discover the courage he needs to become the leader of the herd...and a hero for the ages. This movie is an adventure for the whole family!!! I want to see this so badly, but even the trailer scared Scarlet so badly in the theater!